Our Campus | DISCOVER YOUR GIFTS! Our setting is a natural jewel. 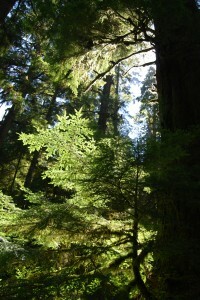 We are located on five acres of cedar and fir forest on Cougar Mountain. Many trees tower well over one hundred feet. Wild deer inhabit the woods. Hillside property is contiguous with more than 250 acres of permanent green belt, which link us to the Cougar Mountain Wildland Park, and provide a rich resource for ecological studies. The Hillside staff was careful to ensure minimum impact on this beautiful forest in its design of buildings and play areas. Our buildings feature classrooms which have a cabin-like feel, a science room, and a spacious theater barn.